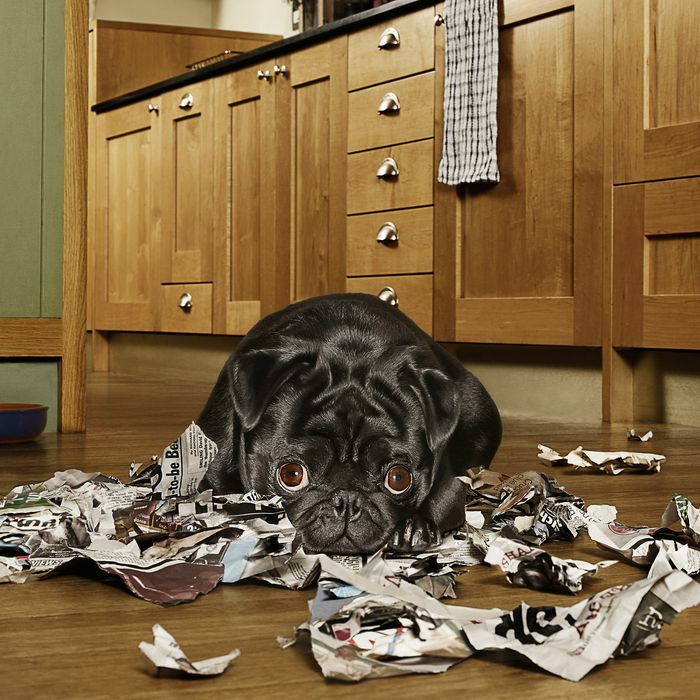 You may already be familiar with Dog Shaming, an incredible corner of the internet where pet owners throw shade at their dogs for such offenses as eating all the birthday cake or part of the living-room chair. If you haven’t seen it, I suggest you take a break from whatever you’re working on and go check it out immediately. If you are — or if you’ve ever owned a dog who has peed in inappropriate places or humped inappropriate legs — you probably know the look a pup will give when it knows it did something wrong: head bowed to showcase a pair of big, sad eyes. As biologist Nathan Lents recently explained in Psychology Today, the people who study animal behavior have a name for that look: It’s called the “apology bow,” and it developed to do much more than just tug on your heartstrings. Long before dogs became domesticated, the apology bow was an essential part of survival. Sharp observers of animal behavior may remark that the “guilty look” has nothing to do with apology or guilt, but rather this is the submissive posture. That is absolutely correct. The actions associated with the apology bow mimic the action shown when a wolf indicates submission to a more dominant, higher-ranking wolf. The head hangs low, panting or smiling stops, eye-contact is avoided, and they literally put their tail between their legs. For your dog, then, you’re the wolf pack that needs to be won over: “As social animals, [dogs] crave harmonious integration in the group and neglect or isolation is painful for them,” Lents wrote. The apology bow is their way of ensuring that you’re still pals — even if it takes a little submission and a little internet-shaming.